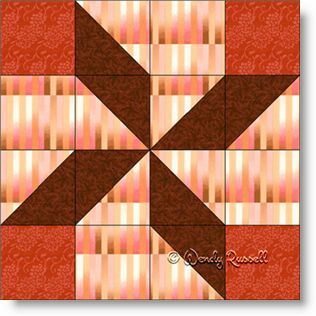 The Windmill quilt block is a good choice for beginner quilters as it contains the two most commonly used patches -- the square and the half square triangle. By switching up your colours you can create a variety of different blocks, all with the same two shapes. This block fits into the category of four patch, as the individual units are sewn into four groups of four. I have also included this block in the category Pinwheels, as the focus of the block looks more like a "pinwheel" than a "windmill" to me. The sample quilts illustrated use a straight setting and an on point setting to display the blocks. By introducing sashing, you can separate the blocks to frame them or just to simply add some extra interest.